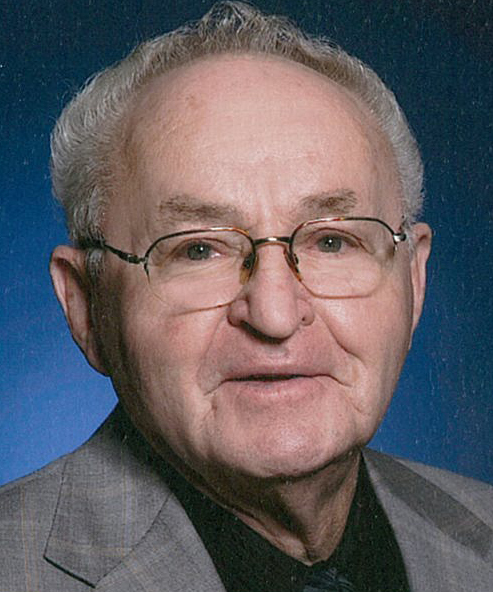 Hastings resident Bernard L. “Bernie” Beiriger, 88, passed away Tuesday, April 9, 2019, at Mary Lanning Healthcare, Hastings, NE. Rosary is 7 p.m. Sunday, April 14, at Butler Volland Chapel in Hastings. Mass of Christian Burial is 10:30 a.m. Monday, April 15, at St. Michael’s Catholic Church in Hastings with Father Jeremy Hazuka officiating. Burial will be at Parkview Cemetery in Hastings. Memorials may be given to St. Michael’s Catholic Church or Hastings Catholic Schools. Visitation is 5-7 p.m. Sunday with family present 6-7 p.m., and one hour prior to service at the church. Bernie was born August 13, 1930, on a farm near Roseland, NE to Arnold & Alvina (Schiefelbein) Beiriger. Bernie later moved to Hastings and attended St. Cecilia High School. He married Jean Laubon on December 2, 1950, at St. Cecilia Catholic Church with Monsignor Grogan officiating and this past December celebrated 68 years of marriage. Bernie worked in sales for various businesses including Tyler Bottling Company (7UP), Huebner Distributing Company (Hamms), Agtronics, Janke’s Supply, and Port Huron out of Lincoln. He worked as a manager for the Knights of Columbus Club, and during retirement as a handyman for City National Bank (Heritage Bank). Bernie was a member of St. Michael’s Catholic Church (where he served as a lector and an usher), Knights of Columbus Fourth Degree and Grand Knight, Lions Club, and president of Legion of Mary. Bernie enjoyed playing pitch, tinkering around the garage where he could fix anything with a glue gun and duct tape, and working in the yard while whistling his favorite tunes over and over and over again. He loved his grandchildren and was interested in all their activities whether it be in Nebraska, Indiana, Arizona, or California. Bernie was preceded in death by his parents and sister, Kathleen Kealy.